This video is the collaborative effort of Mundelein Seminary, the Liturgical Institute, and Midwest Theological Forum. Seminarians often ask for a resource that provides a model to follow in preparing to celebrate the Sacred Mysteries in a way befitting their dignity. With the implementation of the new English translation of the Third Edition of the Roman Missal, all of us have a renewed opportunity to refine what the holy fathers have called the ars celebrandi, the art of celebrating. 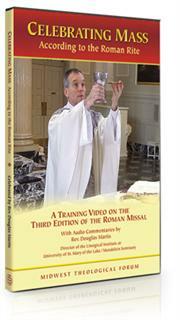 Intended as an instructional video, this DVD is also suitable for anyone that wants to learn more about the celebration of the Holy Mass. Please call our office to inquire about volume discounts!